Today, I’m introducing a new series here on the blog: High-End Heroes, where I’ll be sharing my favorite high-end brand and products that I consider worth the splurge. Whether you’re beefing up your birthday wish list, or ready to treat yourself to something nice, these are my picks to add a little luxury to your makeup collection. 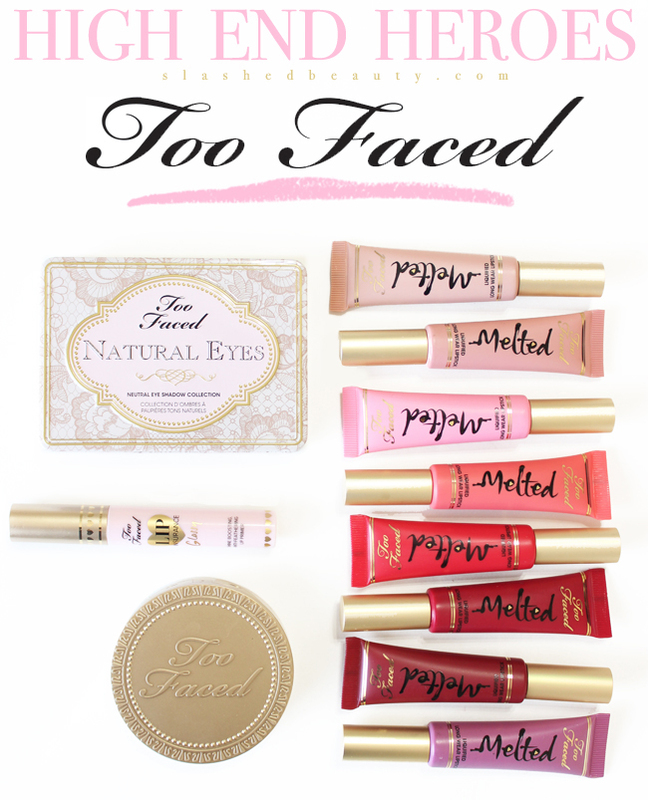 Too Faced is a brand that played a pivotal part in kickstarting my love for makeup. I remember my best friend buying me their Glamour Revolution palette when I was 16, which contained a blush, their Chocolate Soleil Bronzer, two lip glosses and nine colorful eyeshadows. I used the heck out of it… I think I still have one of the shadows depotted somewhere for nostalgia’s sake. The brand has come a long way since then, and a few of their key products are some of my favorites in my own stash. 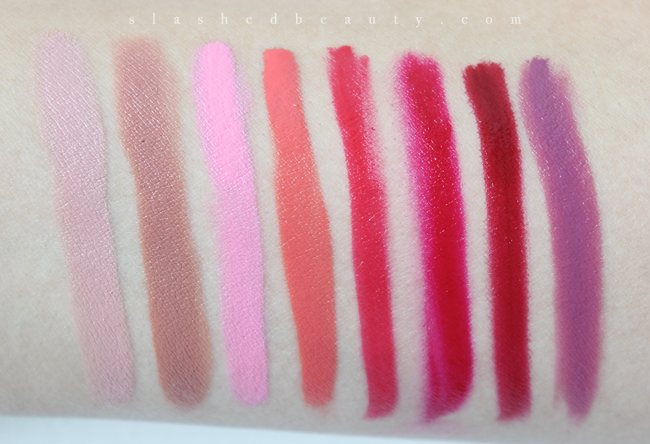 I’ve talked very briefly about the Melted Lipsticks before on Slashed Beauty when comparing them to the L.A. Girl Glazed Lip Paints. Since then, more Melteds have joined the original two I bought, and you can pretty much call me obsessed. These are hands down my favorite liquid lipstick. As you can see, they are all incredibly pigmented and apply with a creamy finish. They’re super long lasting; you’ll be rocking those brighter shades for hours before they go anywhere. All of them sit so comfortably on the lips with a cushy texture that never dries out. I will say the one problem I’ve had with these is the applicator tips drying up and blocking product from dispensing, but running under a hot faucet will usually do the trick. You need hardly a drop to saturate your lips in color, helping to justify the $21 price tag. I don’t think I have ever been let down by any eyeshadow I’ve tried from Too Faced. I know I’ve also reviewed the new Natural Eyes palette early last year, but seriously, this is one well put-together eyeshadow palette. You can tell that the brand was extremely thoughtful in choosing what shades made the cut, with the perfect ratio of matte, satin, and shimmer shades to create all sorts of looks (ya’ll know I’m a stickler for my matte shades!). The shadows are so silky and soft, and not one shade disappoints. I love this palette for traveling since it’s so tiny… smaller than my hand! 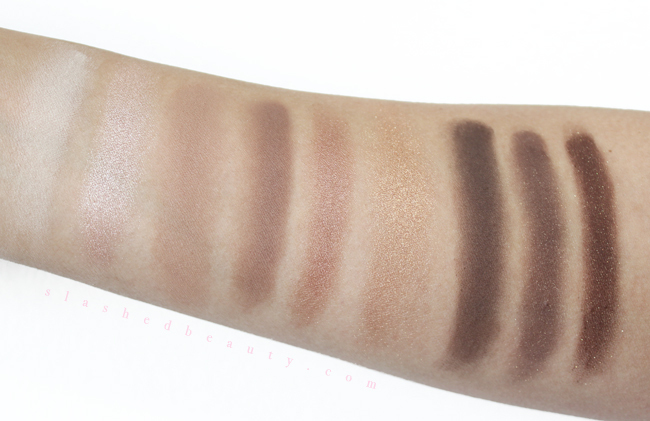 For $36, this is a slightly more affordable neutral palette on the high-end spectrum. Lip Insurance is a new love that I’m not quite sure how I lived without. This lip primer helps your lipsticks and lip glosses reach their full potential in terms of color and wear time. The new Glossy version helps give your lips a little extra shine, and keeps color from feathering. I find this more convenient to use than a lip liner, and for $20, it can make your $1 lipstick to perform like a champ. Oh, Chocolate Soleil, the first bronzer I ever tried. Back in the day, I had no idea what it was for and just powdered it (heavily, I might add) all over my face. That was sure a good look… not. This one is definitely more of the indulgent splurge, since $30 is more than I would normally spend on a bronzer… especially a warm one. But if you know anything about this puppy, you’re probably familiar with it’s chocolatey scent and silky smooth application. I’ve switched from using the original to Deep Chocolate Soleil, which is a little darker and has a matte finish. Back when I had an allowance to blow at Sephora, Too Faced was one of the first aisles I rushed to… still is when I’m window shopping! I respect the brand for creating amazing products that prove themselves by performance rather than just riding on the brand name. If you’ve got money to spend, these are the buys I’d recommend from them. 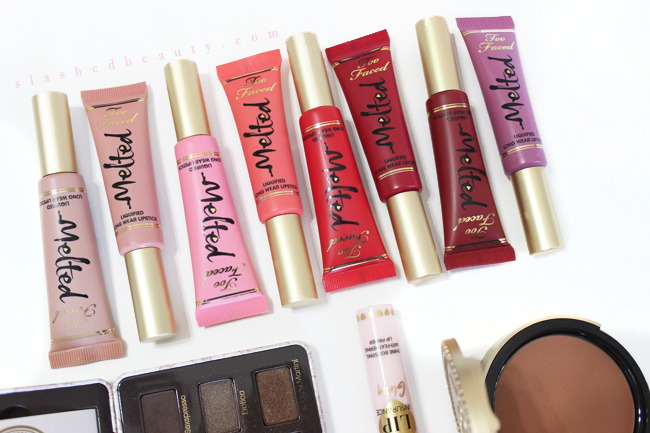 What’s your favorite Too Faced product? I agree with Kath… the smell of that bronzer! 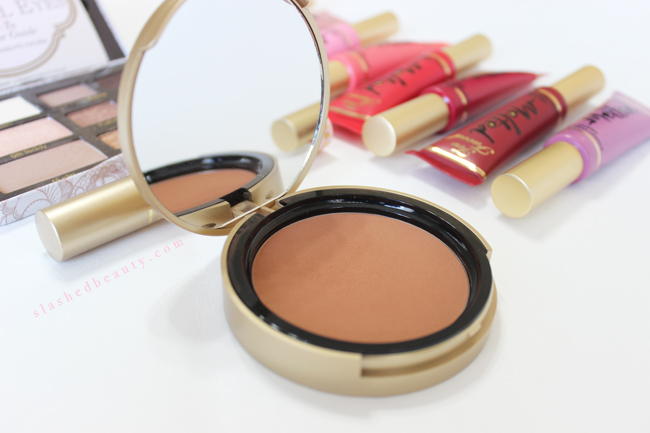 I love that Chocolate Soleil bronzer too! So much I love from the line but especially Too Faced Shadow Insurance. I have several of the palettes and really enjoy those. My favorites are the new Chocolate and Semi-Sweet ones. The melted lipsticks are so pigmented and long lasting! I can’t get over the awesome pigmentation of those lippies!!! Thanks for sharing all the swatches too! TF is one of my favorite brands ever! I am in love with the Melted lippies! I really like Too Faced. Chocolate Soliel is my favorite bronzer. Yep. Pale as I am… The Melted lippies and of course my beloved Chocolate Bar palette. This post has enabled me, I think it’s time to pick up a few more goodies. 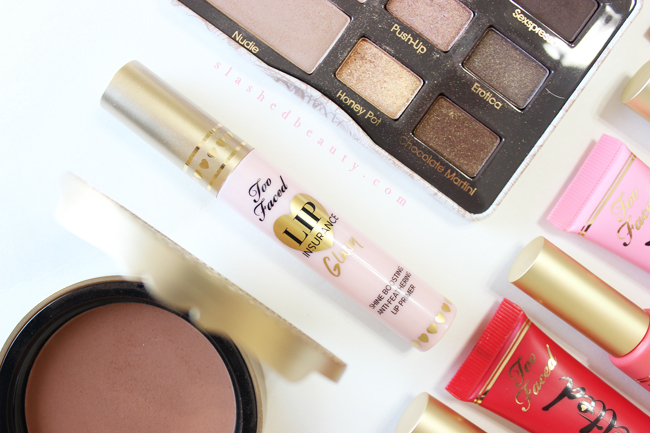 Love the Melted Lippies – they really are a great liquid lipstick. Their La Creme lipsticks are also very high on my favorites list. They just feel *amazing* on the lips. Haven’t come across anything else that is as nice. I need to pick up the Melted lippies. I already see like 5 I want. 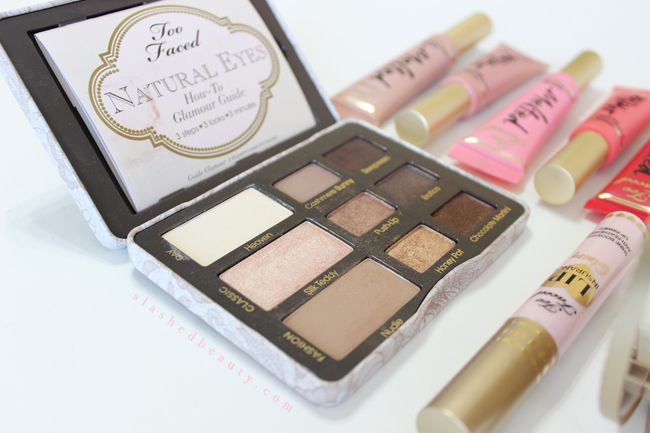 I have so many faves from Too Faced! The Melted Lipsticks for sure and the original Chocolate Bar palette is a top 3 palette fave! I love Too Faced, everything about that brand! Natural Eye is such a pretty palette.